Immediately address complaints to build a positive online reputation. 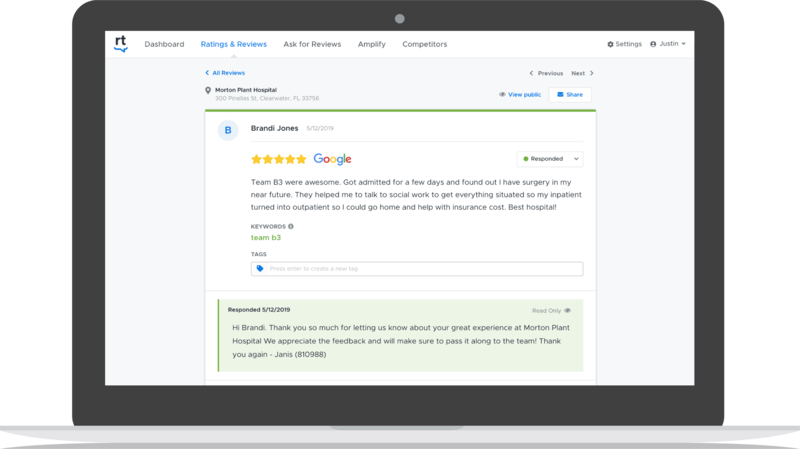 Easily improve local search results by managing review profiles. Our Enhanced Security package meets regulatory requirements and offers minimum user password requirements, password expirations, lockouts, and disallowed password recycling. We provide tools and resources for financial institutions to monitor and analyze reviews of all locations, across all major review sites, in an easy-to-use dashboard. Customers trust online reviews when choosing a new bank. In fact, online reviews are five times more influential than TV advertisements and six times more influential than social media advertisements. U.S. Bank: "Reviews are the most Important social media"
Meet compliance standards and mitigate customer interactions in online reviews before they become government escalations. Smart Response templates enable your managers to use brand-approved language when responding to customers. Use sentiment analysis and customized reporting to improve the customer experience.